Officers hold down a suspect after apprehending him. Eight people are now dead, including a Deputy Sheriff who were shot and killed and the suspect is currently in custody. 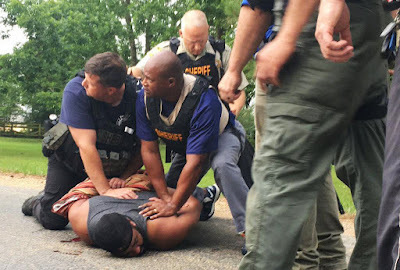 The incident that caused this horrible event to take place was in Mississippi. The suspect a 35-year-old Willie Cory Godbolt confessed on video to The Jackson Clarion- Leader reports. The suspect said that he visited an address Bogue Chitto to talk about his children when neighbors called the police. That is the same time when the deputy arrived. My pain wasn't designed for him. He was just there,"
"We were talking about me trying to take the children home... somebody called the officer.... that's what they do, they intervene. It cost him his life. I'm sorry." Godbolt said. The suspect seems to have wanted to try and commit suicide by police as he mentioned it when he was talking to reporters. "My intentions was to have God kill me. I ran out of bullets," he said. "Suicide by cop was my intention." He said. Authorities said that the officer who was shot was William Durr and was only 36 years of age. Durr had only been with the Lincoln Country Sheriffs Department for two years. It is said that Durr said he loved to make children smile. He had developed an interest for ventriloquism as a boy and he loved to put on puppet shows for kids. The Mississippi Bureau Of Investigation spokesperson said that Warren Strain said that the shootings occurred in three different homes on Saturday night. The rural area of Lincoln County, the shootings happened in Brookhaven and the third in Bogue Chitto. The other seven victims are four women, a man, and two boys. The spokesperson said that investigators are gathering evidence at all of the locations. Authorities also say that Godbolt held a 16-year-old boy hostage at one point in time. That young man was lucky to survive and was released unharmed.